Unique-Desire: Belated Mothers Day Inspired! I actually did this look yesterday, but I didn't have time to post it since I went out of town. So here it is today! This was inspired by the flowers that I got for my mom, Dyed hot pink Daisy's with acid green centers, LOVE! Sorry if the shadows on my face look a little off, I had to take the picture earlier than I normally do. 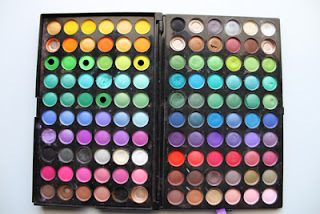 If you do a tutorial on this - which I totally think you should since it's beautiful - can you show us up close pictures of the colors you used from your palette? I don't have a palette like that but have a TON of individual shadows - I'd like to try to match the colors :) beautiful look! LOVE it! I love the brightness of the greens and yellows paired with the fuschia lip!! LOVE this look!!! Awesome job!!! Very beautiful! You have skills girl!